Hotel 5 Elements is one of the most accesible, 3 star hotel in Uttarkashi, lying at an altitude of 1150 mts. It is a spacious and luxurious budget hotel in Uttarkashi with excellent amenities for customers. Uttarkashi is more on pilgrimage circuit then the tourist circuit. The region is one of the perfect place for adventurous activities like mountaineering, trekking. Beautiful high altitude lakes, glaciers of Gangotri and Yamunotri attracts eyes of tourists. The high cliff mountains, the bewitching scenery and the old temples brings smile on face of people that makes the image of whole valley fascinating. Sight seeing facility to famous places like Maneri, Dodital, Dayara Bugyal, Harsil, Sat Tal, Gangotri, Kedarnath, Nachiketa Tal, Gaumukh and Nandan Van Tapovan. 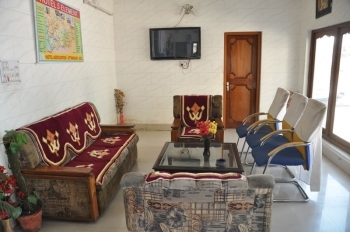 The hotel is located near Gyansu Bus stand, approximately 1.9 kms before Uttarkashi. 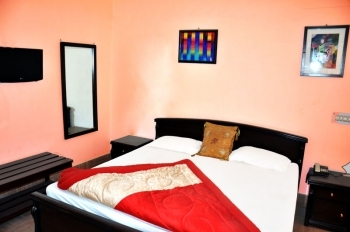 The hotel has 17 Deluxe (AC and non AC), Deluxe Suite rooms, are avilable with in room aminities like LCD TV, Direct Dial Telephone,Dining table,sofa,mineral water e.t.c.. The rooms are provided with beds and mattresses, blankets, fresh linen and towels. The rooms faces river Bhagirathi. Enjoy delicious food in the Restaurant serving ethinic food. A wide range of mouth watering dishes are offered in the restaurant, that suits your budget. Amenities like AC, LCD TV with cable connection, Direct Dial telephones. - Attached bathrooms with hot/cold running water. - Conference hall for seminars and meetings. Rs. 250 per day will be charged extra for AC. - Extra cost for Train/Air fair, Meals and transportation charges. Direct bus to Uttarkashi is easily avilable from Dehradun, Rishikesh, Haridwar. You can board a bus from Delhi to Rishikesh and board a bus for Uttarkashi from there or you can hire a Taxi for Uttarkashi. Uttarkashi is 143 kms from Rishikesh. If you want to opt for train, you can board a train for Rishikesh or Haridwar. From Haridwar, you can either board a bus or a taxi for Uttarkashi. Distance between Haridwar to Uttarkashi is 168kms. Nearest Airport to uttarkashi is Jolly Grant Airport Dehradun. Daily flights are avilable to Jolly Grant from Delhi. From Jolly Grant airport, either directly board a taxi for Uttarkashi or board a taxi for Rishikesh and then board a bus for Rishikesh.